Love is always the answer, in all matters. Uplift your heart when it is sad, when it is lonely, when it is upset. Try not to allow your heart to be troubled, in any matter knowing God is on the Throne in Heaven. His Might is beyond measure and His strength is powerful. Beyond human understanding. Lift up your hearts to the One who can heal all matters , lend your ear to those who need a helping hand. Even yourself. Listen to your own emotions, your own feelings. Listen to your heart when it is sad, for it will tell you the reason why. 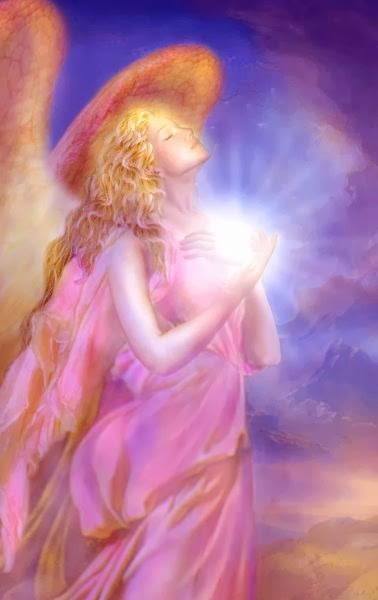 We angels sing praise to God daily as you would say, for there is no time here in Heaven, just eternal Grace and love. Lift up your awareness then to the Heavens where you too, can give praise to God, where only love exists, where only joy exists, where there is eternal peace now and forever. Lift up your hearts to the Most High who is with you and your family and loved ones always. He is listening to you always. He loves you and wants the best for you. He is the ever-lasting God Almighty and is helping you in all matters. Seek Him with a faithful and sincere heart. Seek Him and you will find peace, for peace is within your hearts and is from the Heavenly father, and His son , Jesus Christ. He has always loved you and always will. He never stopped loving you and will always help you in all matters. Do not think you could have ever done something to stop His love, that is an err, and is also not truth. Truth is when you realize you and the Father are one ! As He is one with Jesus, as Jesus asked for you to be one with them- as they were one , so are you one with them. Stay focused on God who loves you while going through transitions in life. There you will find Him and He rewards those who seek him. Uplift you heart beloved when you are ready. Uplift your mind and your thoughts to the Most High. Uplift your emotions, your fears, your concerns , your happiness, your joy. Uplift to the One High God , with Jesus who loves you. There is never a reason for concern. For you are loved and always will be beloved. We angels lift you now. We celebrate your willingness for us to do so. We angels know you love us and we love you too. As the Father loves you, so do we! Be willing to receive miracles ! Be willing to receive Divine Love in your heart! Be willing to seek God in all matters, now and always. Trust that he hears you, Know that your prayers are answered the second they are heard. Thank God in all ways and listen for action steps for you to follow if needed. We understand your transitions can cause fear from the ego. Such as “Will I have enough money?” or ” What am I going to do now?” These are all cries for help and we hear you. We celebrate your willingness to hear our message and lift you now and shift your awareness to Heaven. To the Light, To the Everlasting God and Jesus Christ who are One in Heaven as you are one with them through the Holy Spirit. You are blessed- and you are not forgotten.